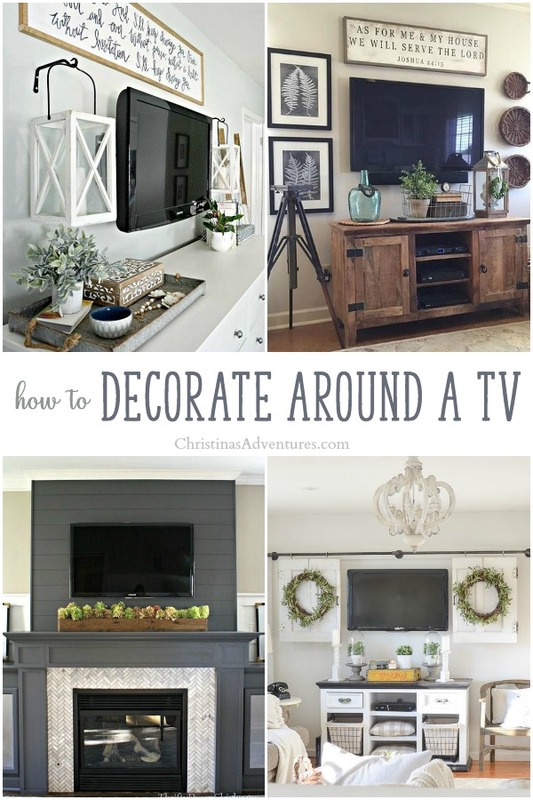 Genius ideas for how to decorate around a TV – lots of ideas for different decor styles! You don’t need a big budget to camouflage a television, just some smart planning! Let’s face it – TVs can be great, but they’re usually not too great to look at. They need to be in a central location in a family room, but no one would really choose a TV as a decoration. I’ve gotten a few requests on my Facebook page to share ideas for how people can camouflage or decorate around a TV. It was so fun figuring out all of the possibilities for hiding a TV in plain sight! There’s lots of great options for any kind of home decor here – hope you’re as inspired by these ideas as I am! This look from Our Vintage Nest is perfect. I love how she’s grouped frames and other items to decorate around the TV, and how the sign at the top draws your eye upwards. 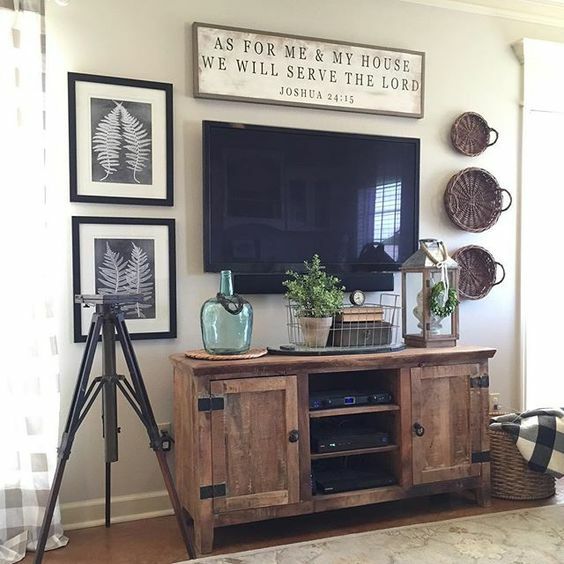 I love this look – lanterns hanging on either side of the TV and a large wood sign on top. Go to Naptime Decorator to see more! 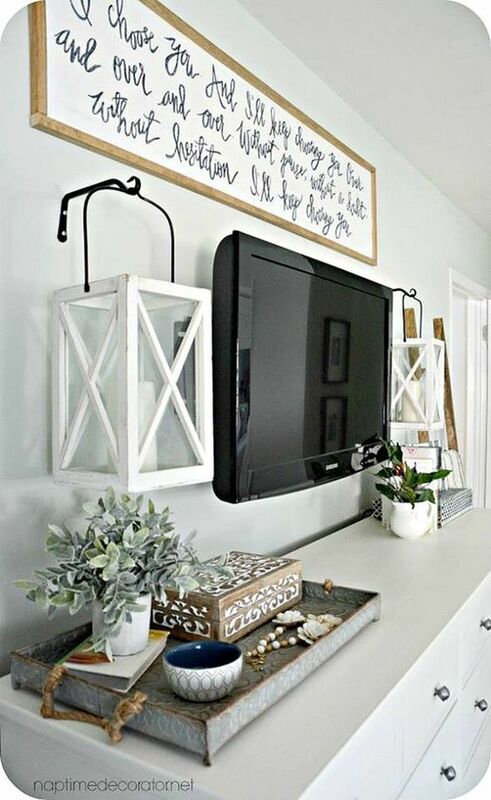 Sarah from Thrifty Decor Chick shows a beautiful and classic way to decorate around a TV. 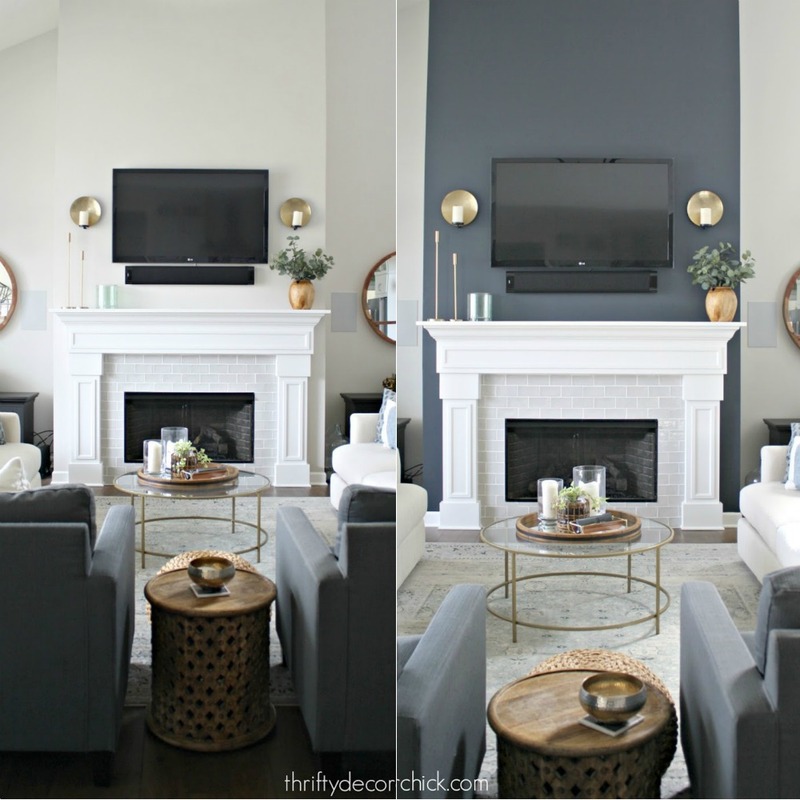 Her dark gray painted mantel surround is dark enough that the TV just doesn’t stick out as much as it would with a lighter color. She also draws your eye towards something else with the simple wood box on top of the mantel. Go see the paint color she used on her blog here. Sarah recently moved and proved that this method works in so many different spaces! The dark surround behind the TV makes a HUGE difference. Come see her post here to read all about the color she chose. 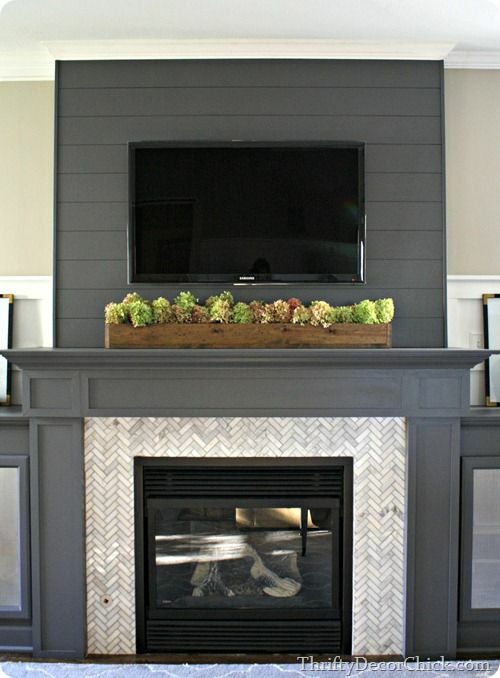 Another great example of a “TV camouflage.” This dark gray fireplace surround helps to hide the TV, and the bookshelves on either side provide enough visual interest that your eyes don’t solely focus on the TV in the middle of the wall. 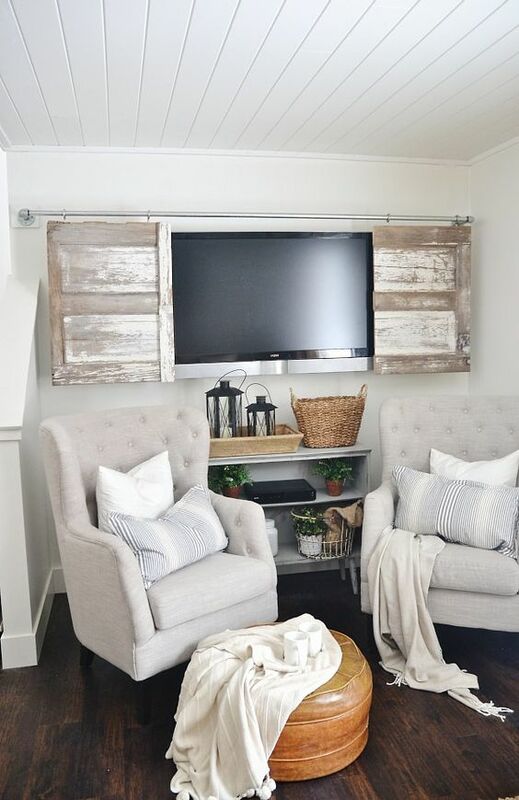 This sliding distressed barn door is a genius way to hide a wall mounted TV. See the whole space from Liz Marie Blog here. 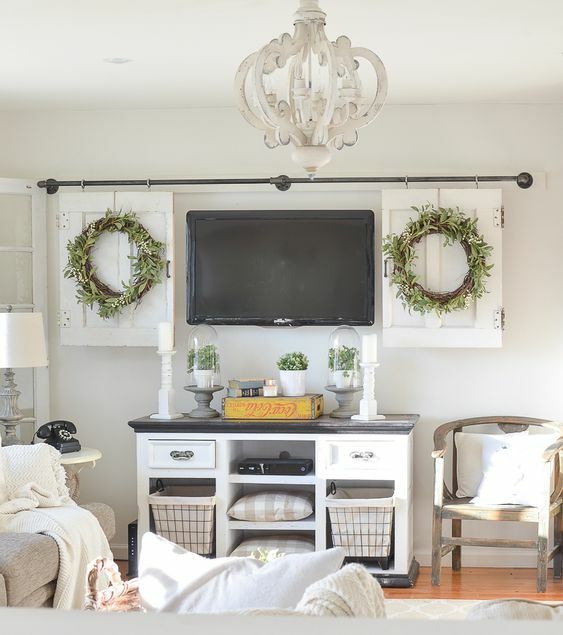 And I just love how Sarah from Little Vintage Nest made her sliding barn door TV cover – those wreaths really make it! She has the whole tutorial laid out on her blog post here. 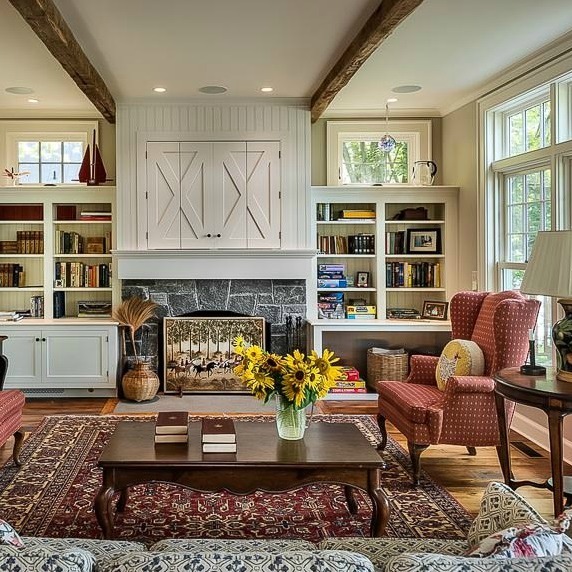 These aren’t sliding barn doors, but actual doors built into the fireplace surround. This look is more custom, but is still do-able. Come see more on the designer’s website here. 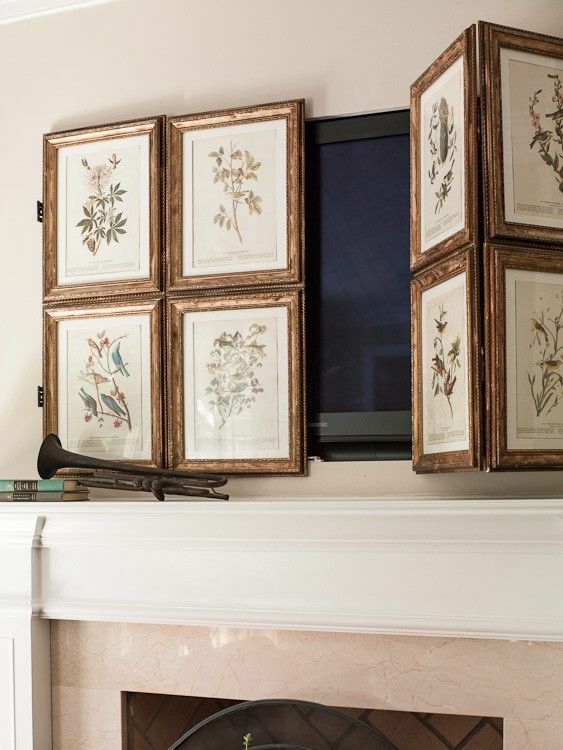 Another great idea – make your TV look like it’s meant to be a piece of art! 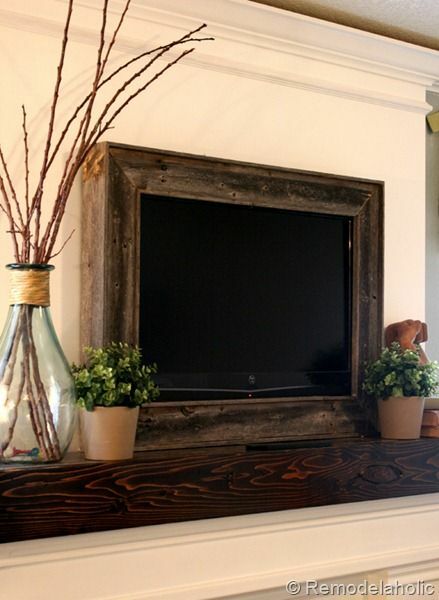 I love this DIY project of making a simple wood frame around your TV. When it’s resting on a mantel like this, it looks very intentional! Get the whole tutorial from Remodelaholic here. This is so smart! Click here to see what it looks like closed – so smart! There’s no tutorial for how to make your own, but it looks simple enough to figure it out! This look can be recreated for pennies! 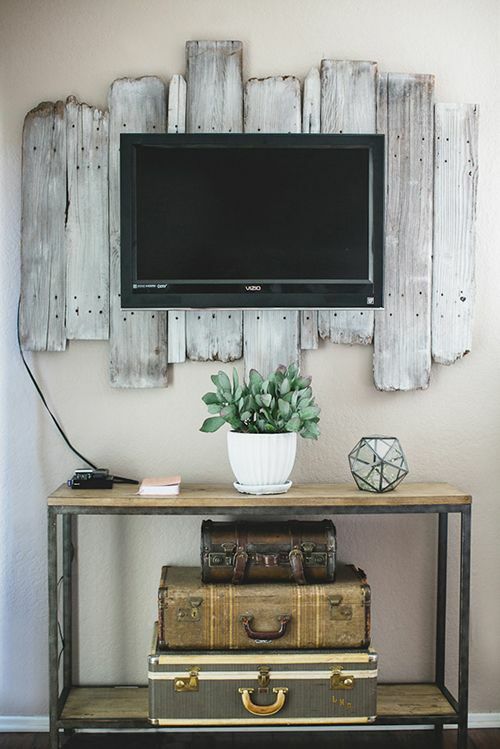 Whitewash some old reclaimed wood and use it as a backdrop for a TV – such a great way to add interest and texture to a wall. Like these ideas for how to decorate around a TV? Please share with others and save for later by pinning here!